This is one of the most widely used custom-printed sticky notes, characterized especially for its simplistic design. It is a practical and cost-effective promotional product. Your company’s name, logo or any other message printed on it guarantees a permanent impact, when distributed as giveaways. Sticky Notes with protective stylish covers have become extremely popular in recent times. Not only do the covers provide additional space for your message, but they also increase the value of the promotional product, which makes it an excellent gift. 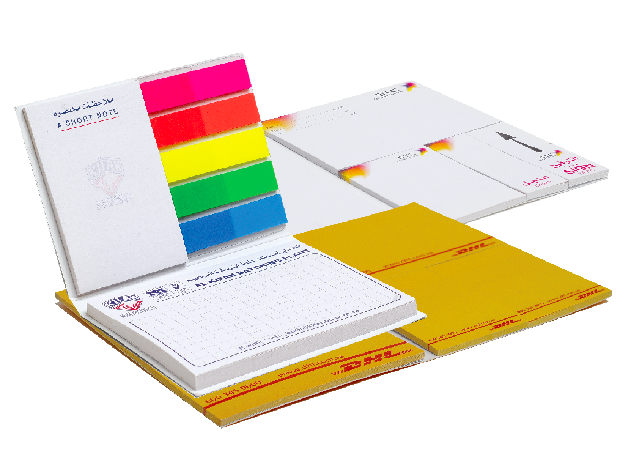 Sticky Notes combined with page markers mounted on a laminated cover makes it an ideal product for a true eye-catching gaze! These colorful markers are perfect for indexing and marking. This kind of sticky notes are obviously marked in long memos, usually found inside various departments of the company. The primary attribute of this kind of sticky notes is to provide an area/space that suits the purpose while revitalizing the company’s identity. Form sticky notes save both time and effort and facilitates the communication procedures between various departments. The sample user just marks the appropriate box for the procedure/action to be looked into afterwards. This sticky note reinforces your message with an attractively shaped impression for a unique and memorable impact. We produce custom-shaped sticky note pads in any shape as per your requirement. This colorful note is the best tool to get noticed. Be different from the rest, customize the shapes and get noticed. These product-shaped sticky notes never fail to impress. They are extremely useful in a way that customers can notice your logo or message every time they reach out for a note. The idea of Slope Notes is considered to be one of most recent technologies in the industry of sticky notes. Slope stick notes present the product in a sliding way along with its extreme thickness. Fascination and uniqueness are two major characteristics of this kind of note that elevates the image of the products and services of the company in an extremely striking way. This product represents an ideal promotional gift, providing on-going promotion.